Two cars of a packed southbound A train jumped from the track and collided with a wall between 135th Street and 125th Street Tuesday morning. No deaths were reported, but over two dozen people sustained minor injuries. 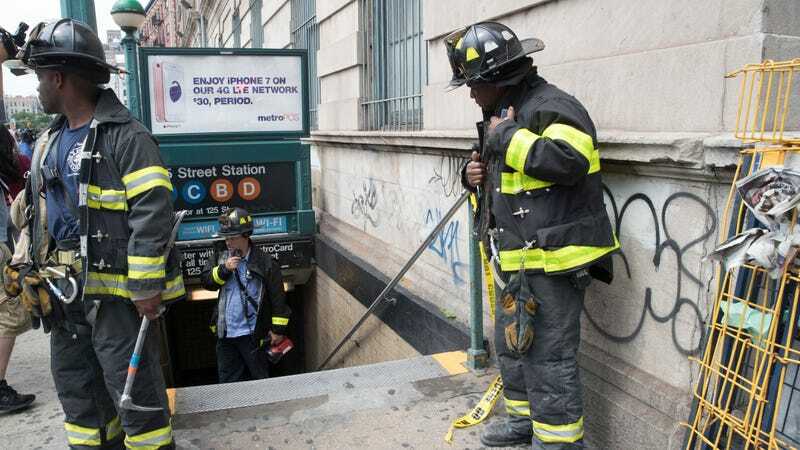 The emergency brake had been activated, which caused the train to veer off the tracks, but it’s unclear why, Metropolitan Transportation Authority leader Joseph J. Lhota said, according to The New York Times. There were over 800 people in the tunnel after the crash and it took them over an hour to evacuate. Thirty-four people were reported as injured. Cell phone recordings from riders show a darkened train filled with smoke. ... about 200 feet of track and multiple signals damaged and mounds of concrete shorn from the walls — that a track worker said it was highly unlikely that regular service along the line could be restored by the end of the day. Meanwhile, Twitter user Tolly Wright offered a first-hand account of the evacuation. This crash is just the latest in a string of incidents that have riders criticizing the state of the subway, which sees an annual ridership of over 2.7 billion people. Among other things, frequent and long delays have tempers running high. Indeed, following Tuesday’s crash, New Yorkers wasted no time in rage-tweeting at New York State Governor Andrew Cuomo, who pledged earlier this year to fix the subway.